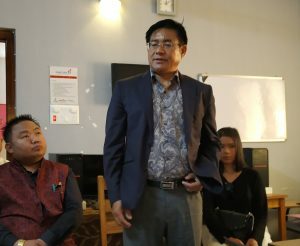 Mhathung Yanthan speaks during the registration event for unemployed youths at the Emporium Skill Training Institute, on February 9 in Dimapur. Dimapur, Feb. 9: Unemployed youths from Sanis in Wokha registered at the Emporium Skill Training Institute (ESTI), on Feb 9 at Half Nagarjan in Dimapur. The event was sponsored by member of legislative assembly (MLA) Mhathung Yanthan. Yanthan, the advisor for Horticulture, said unemployment was the biggest challenge to the Naga people. “The issue of unemployment is a big challenge and I always had the urge to help the unemployed youths,” he said during an interaction. Calling unemployment a matter requiring attention, Yanthan urged the attendees and unemployed youths in general to look beyond government jobs and start seeking private jobs as well. “Nagas in general lack job satisfaction, and only opts for salary-based work, irrespective of job satisfaction. And this is one reason why Nagas cannot grow and catch up with the rest of the country,” he said. Yanthan said to be sponsoring uniforms and health insurance for thirty students while the course fee is sponsored by the govt. of India (Pradhan Mantri Kaushal Vikas Yojana) in collaboration with the Nagaland state government (National Skill Development Corporation). He was of the opinion that the problem of unemployment cannot be an onus only of the government. The advisor said Nagaland is a small state with excessive employment in the government sector which is sapping the resources of the state even if it is from paying salary to employees. The youths of the present generation need to engage in private firms, he said. For this, they need skills, he reminded. He urged the candidates to be sincere, disciplined and to demonstrate enthusiasm throughout the course. The head of operations of the Emporium, Anirban Mukherjee gave an introduction about the institution, which was said to have started in August 29 2018. About 220 trainees have already been placed in various parts of the country and abroad. Also, Mukherjee asked youths to be cautious of fake agencies and fraudsters who promise jobs outside the state. He reminded that walk in interviews especially in aviation, cruise lines and 5-star hotels for the state will be available but processed though the Emporium and not through any other agency. Approximately 30 candidates registered at the skill training institute.